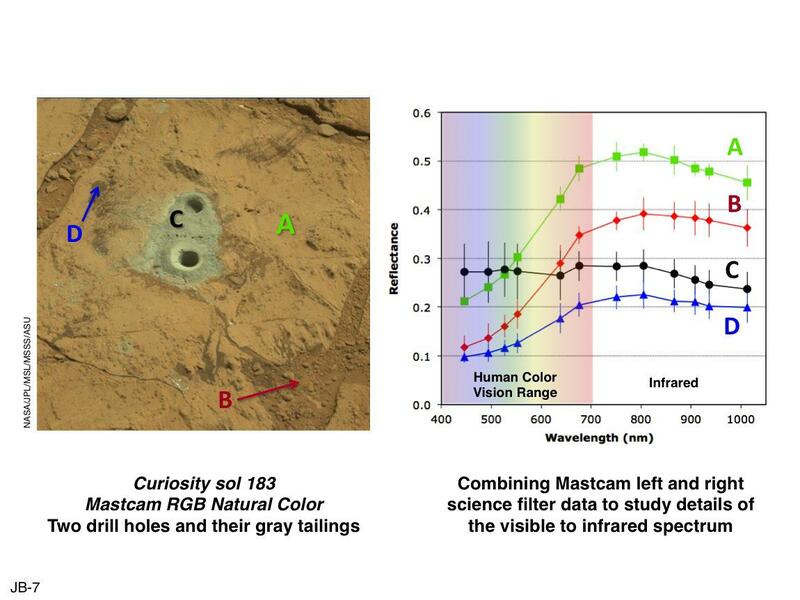 This set of images illustrates how the science filters of the Mast Camera (Mastcam) on NASA's Mars rover Curiosity can be used to investigate aspects of the composition and mineralogy of materials on Mars. On the left is an estimated "natural" color view of Curiosity's full drill hole and mini-drill hole within the "John Klein" outcrop in "Yellowknife Bay" on Sol 183 (Feb. 9, 2013). Natural color simulates approximately what the colors would look like if we were to view the scene ourselves on Mars. On the right is the result of plotting the calibrated level of reflectance (the percentage of incident sunlight that is reflected off the surface) of each of the indicated areas of the image as a function of wavelength (color). 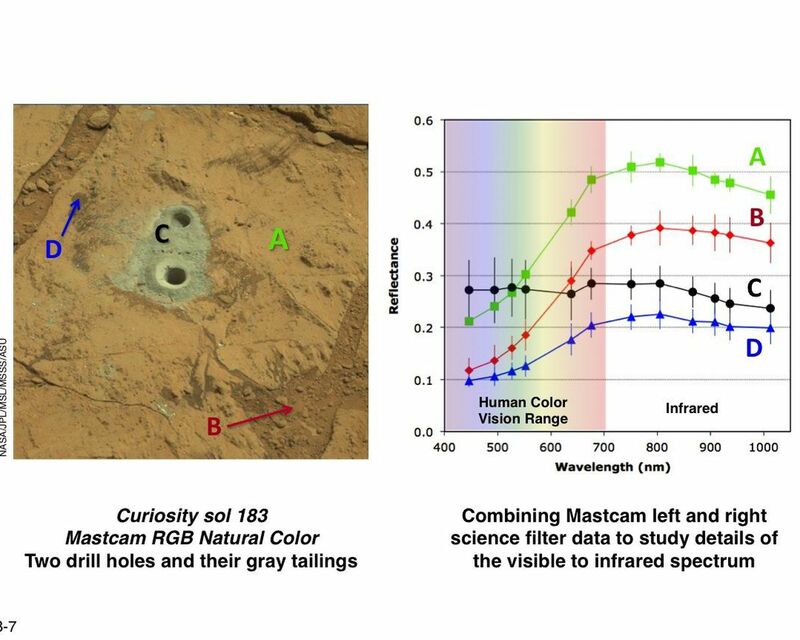 The wavelengths correspond to the Mastcam science filters plus the red, green and blue wavelengths of the Mastcam Bayer filters (for a total of 12 unique wavelengths between the two Mastcam cameras). 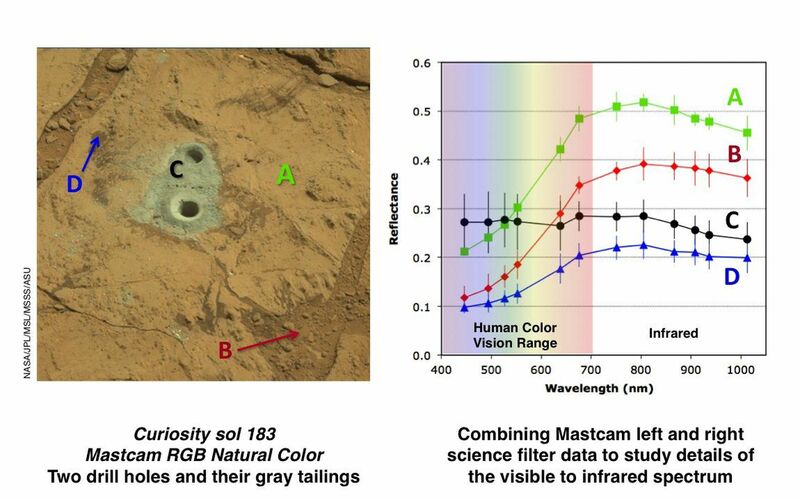 The six filters at the lower wavelengths are within the range of typical human color vision, while the six filters at the higher wavelengths represent infrared colors that our eyes are not sensitive to, but which the Mastcams can detect. See also PIA16806 for additional details. NASA's Jet Propulsion Laboratory, Pasadena, Calif., manages the Mars Science Laboratory Project and the mission's Curiosity rover for NASA's Science Mission Directorate in Washington. The rover was designed and assembled at JPL, a division of the California Institute of Technology in Pasadena.